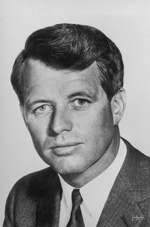 KENNEDY, Robert Francis, (brother of John Fitzgerald Kennedy and Edward Moore Kennedy, grandson of John Francis Fitzgerald, uncle of Patrick J. Kennedy, and father of Joseph Patrick Kennedy II), a Senator from New York; born in Boston, Suffolk County, Mass., November 20, 1925; graduated from Milton (Mass.) Academy; served in the United States Navy Reserve 1944-1946; graduated from Harvard University in 1948 and from the University of Virginia Law School in 1951; admitted to the Massachusetts bar in 1951; attorney, Criminal Division, Department of Justice 1951-1952; campaign manager for John F. Kennedys election to the United States Senate in 1952; assistant counsel, Senate Permanent Subcommittee on Investigations 1953; assistant counsel, Hoover Commission 1953; chief counsel to the minority, Senate Permanent Subcommittee on Investigations 1954, and chief counsel and staff director 1955; chief counsel of Senate Select Committee on Improper Activities in the Labor or Management Field 1957-1960; campaign manager for John F. Kennedys election to the Presidency in 1960; Attorney General of the United States from January 1961, until his resignation September 3, 1964, to be a candidate for the United States Senate; elected as a Democrat from New York to the United States Senate and served from January 3, 1965, until his death; died from the effects of an assassins bullet at Los Angeles, Calif., June 6, 1968, while campaigning for the Democratic presidential nomination; interment in Arlington National Cemetery, Arlington, Va. Dictionary of American Biography; The Yale Biographical Dictionary of American Law; Palermo, Joseph A. In His Own Right: The Political Odyssey of Senator Robert F. Kennedy. New York: Columbia University Press, 2001; Thomas, Evan. Robert Kennedy: His Life. New York: Simon & Schuster, 2000; Schlesinger, Arthur M., Jr. Robert Kennedy and His Times. 2 vols. Boston: Houghton Mifflin, 1978.